Having taken care of my own children during their toddler years and many others I would have loved to have this product from Axsels Home Ware. This is a placemat and plate all in one. 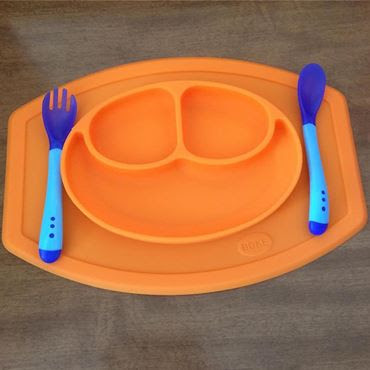 It is made from food grade silicone, BPA free, PVC free, and chemical free. I love that this sticks to the surface so that learning eaters can eat without having their plate flip over or even better for us caregivers harder for them to pick up and throw. I like to take a wet rag and wipe the spot where this is to be used first seems to give it extra stick. This set also comes with a soft fork and spoon for no pain eating for your learning child. Nothing more discouraging then a child hurting themselves with a metal fork which causes them to go back to using their hands. This will give them teachable moments without pain. This would make a great gift for the new mom of a toddler, or anyone who needs a little extra helping hand. Easy clean up by hand or in dishwasher. The silicone placemat plate can be found at my affiliate link below. Disclosure: MarksvilleandMe received one or more of the products mentioned above as part of a promotion with Tomoson and Axsels Home Ware. Regardless, MarksvilleandMe only recommends products or services we use personally and believe will be good for our readers. Some of the links in the article may be “affiliate links.” This means if you click on the link and purchase the item, I will receive compensation. If you would like MarksvilleandMe to review or promote a product or service please contact us at marksvilleandme@gmail.com.